The Wilson family is pleased to announce an exciting change to our fishing & hunting guide service . The “Big Murphy Pool ” is home to our brand new executive grade sporting lodge and with major upgrades to our cabins we are sure to make your trip the most successful and the most comfortable . 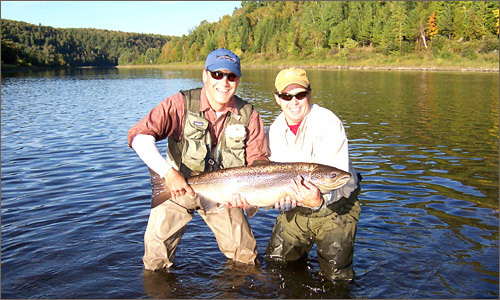 When you think Atlantic salmon fly-fishing , the first place to come to mind is the Miramichi River , and when you think top quality private fishing pools and the best possible guide service you should automaticly think Wilson’s Sporting Camps . The same goes for our World Class Upland Bird hunting . You will not find better service , better dogs or better covers than right here at Wilson’s. For almost a century and a half the Wilson family has been in the business of providing great Atlantic Salmon fly fishing, hunting and outdoors adventure to discriminating clients from around the world. We are located in the Miramichi River valley of New Brunswick, one of the most scenically beautiful places in Canada. A pristine, â€œjust as God made itâ€ place that offers some of the finest Atlantic Salmon fly-fishing and wing shooting on the North American continent. The Miramichi is known as “the mother of all salmon rivers” for hosting the largest runs in the world of Atlantic salmon, “the king of game fish”. Wilson’s owns and leases more private water on the Miramichi than any other outfitter or individual – a total of 16 pools, many of then among the rivers finest, which means that we can provide our clients with Atlantic Salmon fishing virtually unmatched for variety and quality in all of Atlantic Canada. We are offering groups exclusive access to the entire operation in order to maximize privacy, service and comfort. The king of game fish, The Atlantic Salmon and other local attractions such as the Old Mill Pond Golf course, walking trails, museums and miles of open wilderness helps make Wilson’s a favorite destination among world travelers. Please visit our Atlantic Salmon Articles page for a few great atlantic Salmon fishing stories from people who have experienced the magic included in a stay at Wilson’s on the Miramichi.